David Malet Armstrong's book Knowledge, Truth and Belief (1973, pp.150-61) contains an important analysis of the infinite regress of inferences - "reasons behind the reasons" - first noticed by Plato in the Theatetus (200D-201C). Armstrong is cited by Hilary Kornblith and other epistemologists as restoring interest in "externalist" justification of knowledge. 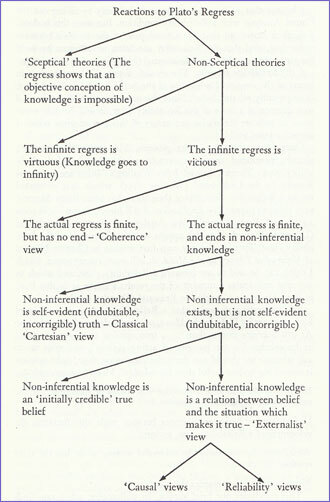 Since Descartes, epistemology had been focused on "internalist" justifications. Armstrong does not subscribe to traditional views of justifying true beliefs, but he cited "causal" and "reliabilist" theories as direct non-inferential validation of knowledge. Direct validation or justification avoids the problem of the infinite regress of inferences. Causality and reliabilism also were not original with Armstrong. He referred to the 1929 work of Frank Ramsey. Today these ideas are primarily associated with the name of Alvin Goldman, who put forward both "causal" (in 1967) and "reliabilist" (in 1969) theories of justification for true beliefs (apparently not being familiar with the earlier Ramsey work, since it is not mentioned in the early Goldman papers? According to "Externalist" accounts of non-inferential knowledge, what makes a true non-inferential belief a case of knowledge is some natural relation which holds between the belief-state, Bap ['a believes p'], and the situation which makes the belief true. It is a matter of a certain relation holding between the believer and the world. It is important to notice that, unlike "Cartesian" and "Initial Credibility" theories, Externalist theories are regularly developed as theories of the nature of knowledge generally and not simply as theories of non-inferential knowledge. But they still have a peculiar importance in the case of non-inferential knowledge because they serve to solve the problem of the infinite regress. Externalist theories may be further sub-divided into 'Causal' and `Reliability' theories. 6 (i) Causal theories. The central notion in causal theories may be illustrated by the simplest case. The suggestion is that Bap ['a believes p'] is a case of Kap ['a knows p'] if 'p' is true and, furthermore, the situation that makes 'p' true is causally responsible for the existence of the belief-state Bap. I not only believe, but know, that the room is rather hot. Now it is certainly the excessive heat of the room which has caused me to have this belief. This causal relation, it may then be suggested, is what makes my belief a case of knowledge. Ramsey's brief note on 'Knowledge', to be found among his 'Last Papers' in The Foundations of Mathematics, puts forward a causal view. A sophisticated recent version of a causal theory is to be found in 'A Causal Theory of Knowing' by Alvin I. Goldman (Goldman 1967). In the second place, and much more seriously, cases can be envisaged where the situation that makes 'p' true gives rise to Bap, but we would not want to say that A knew that p. Suppose, for instance, that A is in a hypersensitive and deranged state, so that almost any considerable sensory stimulus causes him to believe that there is a sound of a certain sort in his immediate environment. Now suppose that, on a particular occasion, the considerable sensory stimulus which produces that belief is, in fact, a sound of just that sort in his immediate environment. Here the p-situation produces Bap, but we would not want to say that it was a case of knowledge. 6 (ii) Reliability theories. The second 'Externalist' approach is in terms of the empirical reliability of the belief involved. Knowledge is empirically reliable belief. Since the next chapter will be devoted to a defence of a form of the Reliability view, it will be only courteous to indicate the major precursors of this sort of view which I am acquainted with. Once again, Ramsey is the pioneer. The paper 'Knowledge', already mentioned, combines elements of the Causal and the Reliability view. There followed John Watling's 'Inference from the Known to the Unknown' (Watling 1954), which first converted me to a Reliability view. Since then there has been Brian Skyrms' very difficult paper 'The Explication of "X knows that p" ' (Skyrms 1967), and Peter Unger's 'An Analysis of Factual Knowledge' (Unger 1968), both of which appear to defend versions of the Reliability view. There is also my own first version in Chapter Nine of A Materialist Theory of the Mind. A still more recent paper, which I think can be said to put forward a Reliability view, and which in any case anticipates a number of the results I arrive at in this Part, is Fred Dretske's 'Conclusive Reasons' (Dretske 1971).